This film has been on my ‘must see’ list for a while but it proved very difficult to track down a copy. Even then I ended up with a Telugu dub without subtitles, and when I did manage to download subs they were somewhat selective in the translation, declining to translate any of the Hindi, and a bit hit and miss with the rest. However they did at least provide translations of Ilaiyaraaja’s wonderful songs which are definitely high points of the film. 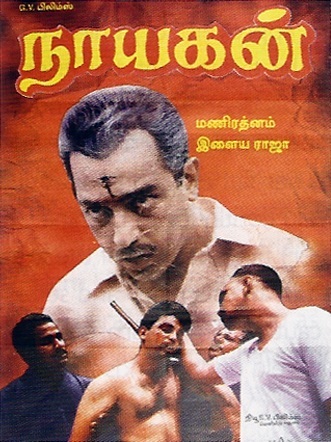 Nayakan is one of Mani Ratnam’s earlier films, and is the movie that brought him to the attention of the cinematic world outside the Southern film industry. It’s based on the story of Varadarajan Mudaliar, aka Vardhabhai, one of the notorious gangsters who controlled the underworld in Mumbai during the 70’s and 80’s. 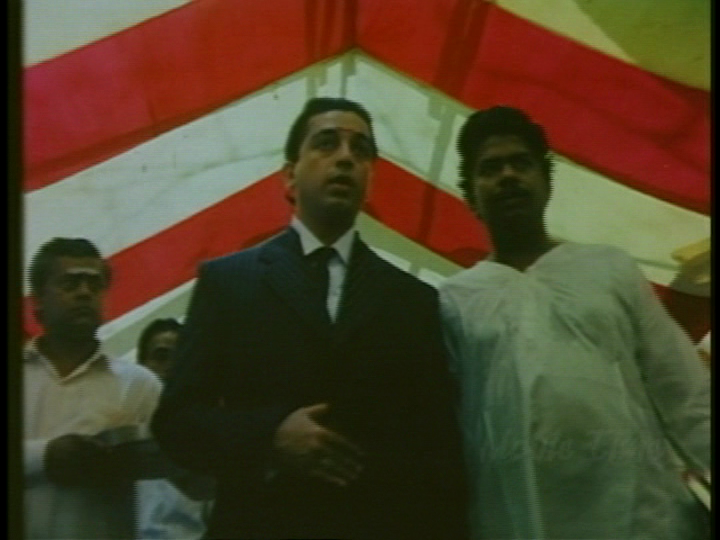 There are also shades of Coppola’s The Godfather, but essentially Nayakan is a very Indian story, full of emotion and seeped in the violence and grime of the slums of the city. Kamal Hassan won a National Award for his performance as did P.C. Sriram for cinematography and Thotta Tharani for best art direction, all of which were very justly earned. The film also features Saranya Ponvannan in her screen début and a generally notable cast including Nasser, Janagaraj, Delhi Ganesh and Tinnu Anand. But above all this is Kamal Haasan’s film and he is riveting in a stand-out performance which sees him grow from a young man to an ageing don in the slums of Mumbai. 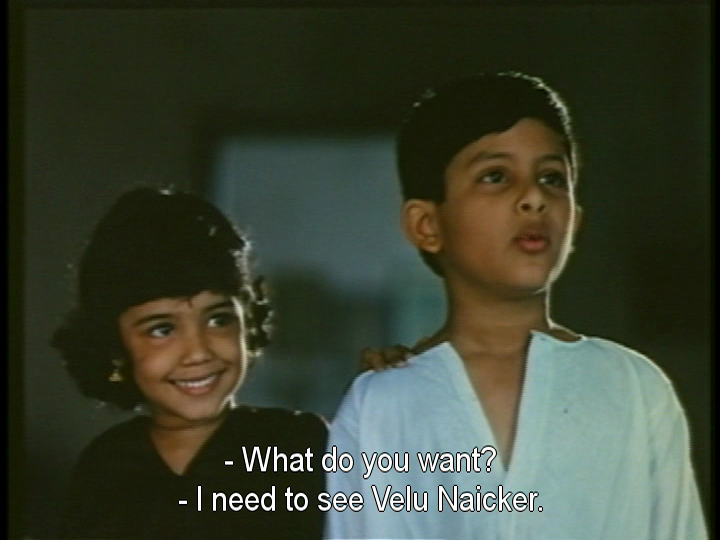 The film starts with the young Velu Nayakar being used by the police to track down and kill his father, a prominent anti-government unionist. It’s a brutal introduction and it’s certainly apt as the film doesn’t shy away from showing the violence associated with the underworld. The poignant refrain of Thenpaandi Cheemayile comes from the beating the young child suffers, and the song is reprised throughout the film to underscore the importance of pivotal scenes in Velu Nayakar’s life. This clip shows two of the versions and, although they both occur much later in the film it’s not really the song rather than the images I wanted to include. However it is worth noting the cinematography and the way P.C. Sriram uses light so effectively in these two snippets. The song is sung by Ilaiyaraaja and Kamal Haasan himself. Velu arrives in Mumbai and is adopted by a small time smuggler who instils in Velu the concept that any slightly less than legal act isn’t wrong if it helps someone. Over time Velu starts to stand up for the rights of the Tamil people who live in the slums, but it is the murder of his adopted father by a police officer that tips the balance and sets him against the law as he takes his revenge. However even this act is tempered when Velu comes to understand that the dead police officer has a mentally retarded son and he gives Kelkar’s widow money to ensure that both she and her son will survive. This dichotomy occurs throughout the film where Velu is shown as a very human character who smuggles and murders but also helps out when members of his community are arrested or when a child is seriously ill. He’s a man who makes mistakes and pays dearly for them, but he’s also someone who is trying to make life just a little better for the people around him. One such instance is when the slum is about to be bulldozed to make way for a factory. Velu organises a gang of the locals and goes to the developer’s house, tearing it apart to drive home the point that these are people’s homes which are being destroyed, not just a piece of land. 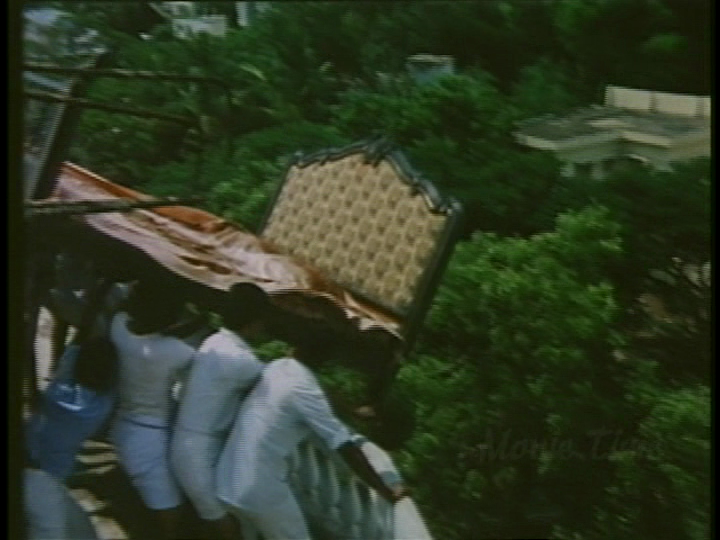 It also looks like a lot of fun as the gang rips apart furnishings and throws furniture from the roof! Velu isn’t a don who drives around in the cavalcades of vehicles more commonly seen in Southern Indian films, but instead he has a fleet of ambulances and lives in a house which is easily accessible for the people of the slum, making Velu Nayakan a more realistic and believable character. There are a few odd moments however, such as an item-style dance number on a boat, and an instance where Velu does appear to be channelling the Godfather given his choice of natty pin-striped suit. More commonly however the dim lighting and traditional dress suit the more modest and unassuming Velu, who seems more embarrassed than anything by the adulation he receives. 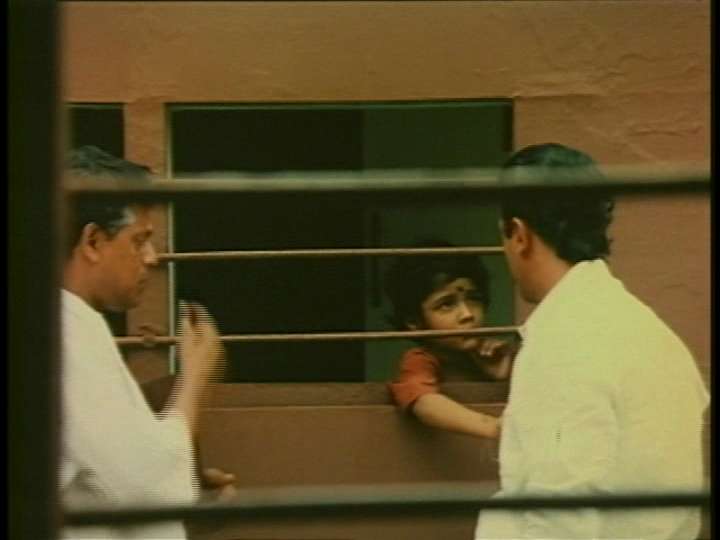 Mani Ratnam’s screenplay is most effective in describing the relationships between Velu and the other characters, in particular those of his immediate family. His first meeting with Neela (Saranya Ponvannan), who becomes his wife, is beautifully acted and filmed as the two meet in a brothel. Velu and his friend Selvam (Janagaraj) end up at the brothel after smuggling success and while Selvam appears to have been there before, Velu looks a little more uncomfortable and out of place. He does manage to enjoy this great song though before heading upstairs for some more intimate amusement. When Velu gets upstairs, Neela is waiting in the room and almost the first thing she does is ask if she can leave early to study for her exams. 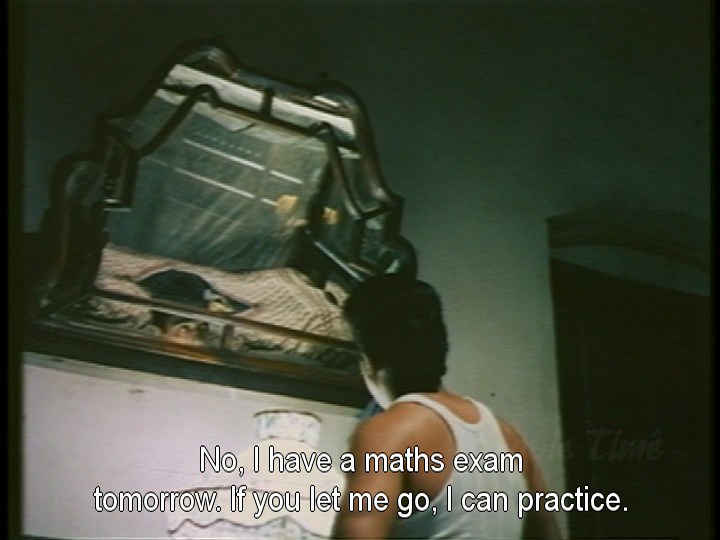 Velu’s reaction is as awkward and confused as would be expected and Kamal Haasan shows this in his indecision as to whether he should lie on the bed or sit on the chair as she studies. Even his hesitancy the next morning, when he’s not sure if he should wake Neela or not, nicely illustrates Velu’s more compassionate side and this is brought out again when the couple do eventually marry. Saranya is dignified as Neela, despite starting out in a brothel and she brings a very warm and sympathetic presence into the harsh reality of the slums. P.C. 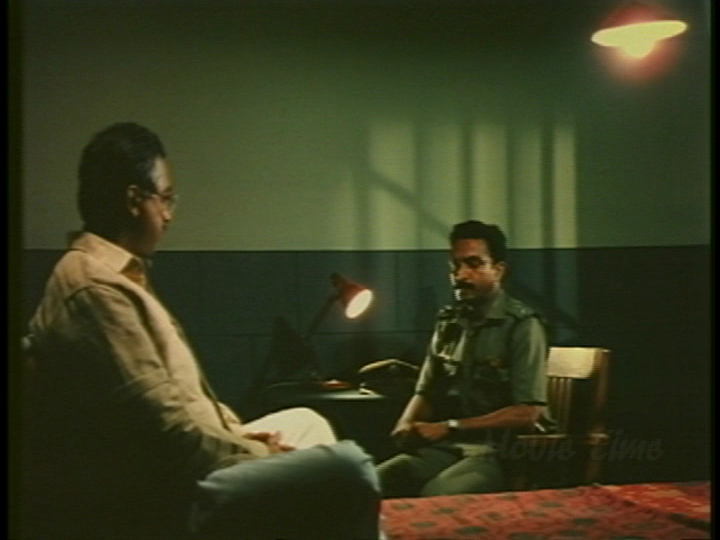 Sriram makes good use of the set here as initially Velu stands in the light while the mirror shows a shadowy figure through the curtains of the bed in the darkness of the room beyond. It’s very effective and throughout the film there is a similar use of light and shadow with many shots framed by pillars, doorways or other architectural features. 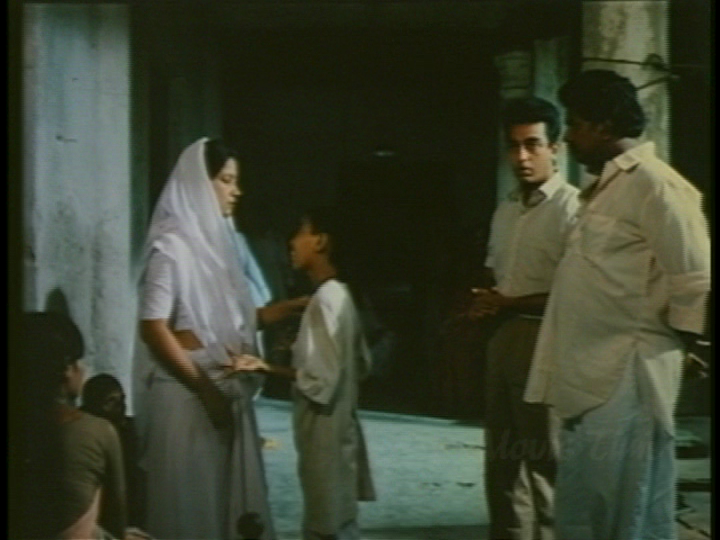 The best scenes in the film are those between Velu’s son Surya (Nizhalgal Ravi) and daughter Charumati (Karthika). Surya hero worships his father just as much as do the local people in the slum, and he wants nothing more than to be like him. He stands in for his father when a member of the community comes to Velu for help and he sees nothing wrong with the life of a gangster. However Charu has a very different opinion and eventually she leaves her father after some very emotive scenes where Charu repudiates her father’s lifestyle. She feels that his style of life is entirely wrong no matter how many people he helps, and Velu is helpless in the face of her rejection. 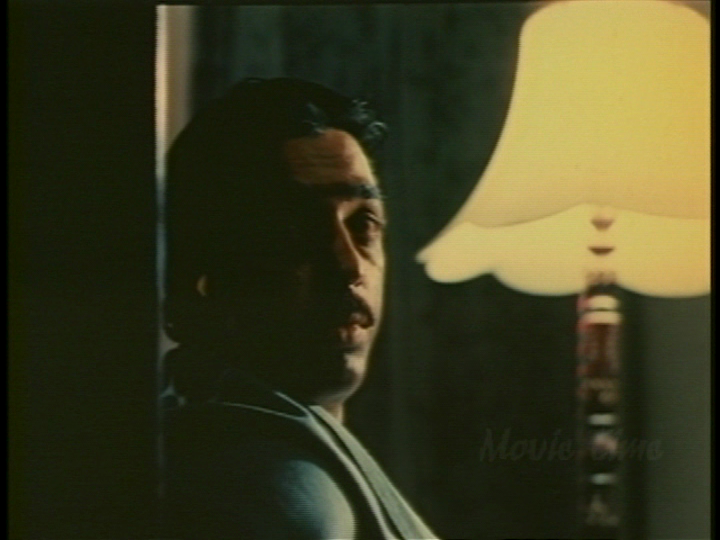 Kamal Haasan and Karthika are absolutely brilliant together in these scenes and also later on when Charu turns up later married to Velu’s new nemesis, the new Assistant Commissioner (Nasser). Charu refuses to allow her father to see his grandson in another tear jerker moment, although the most poignant scene in the film between Velu and his grandson is reserved for the end. There are many small moments and clever touches in the film which make it so enthralling. From the joy seen at the Holi celebrations to the despair when Neela dies and her sari unravels in Velu’s hands, each scene is full of little details which add to the drama. Kamal Haasan provides much of the emotion and driving force in the film, but all the actors are excellent even in the minor roles. 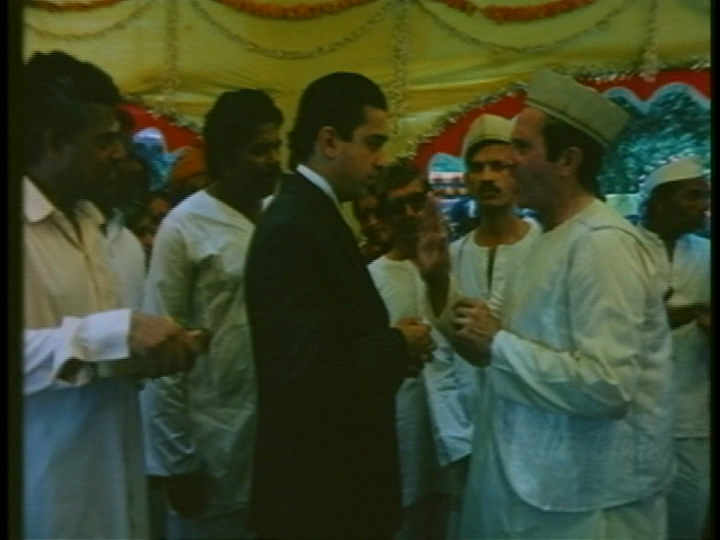 Tinnu Anand deserves special mention for his small but important role as Ajith Kelkar, the grown up mentally retarded son of the police officer, and Nasser is very effective in his short time on screen towards the end of the film. Beautifully haunting music, gritty realistic scenes and an outstanding performance by Kamal Haasan make this a film well worth hunting down, and it really deserves to be restored and released with English subtitles. 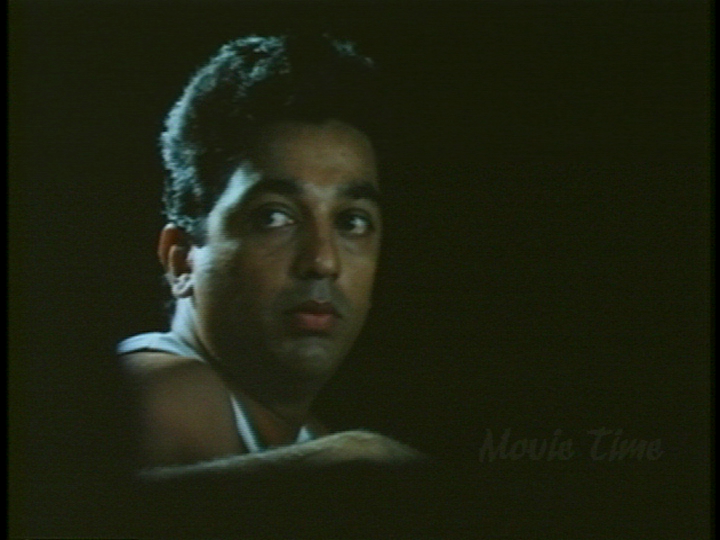 Nayakan is an absolute classic from Mani Ratnam, and it’s one I thoroughly recommend. A full 5 stars.